Update: Google Buzz has been retired and replaced by Google+. You can read more about the platform on Wikipedia. It feels like there is not a day where Google is not updating or publishing a new service. 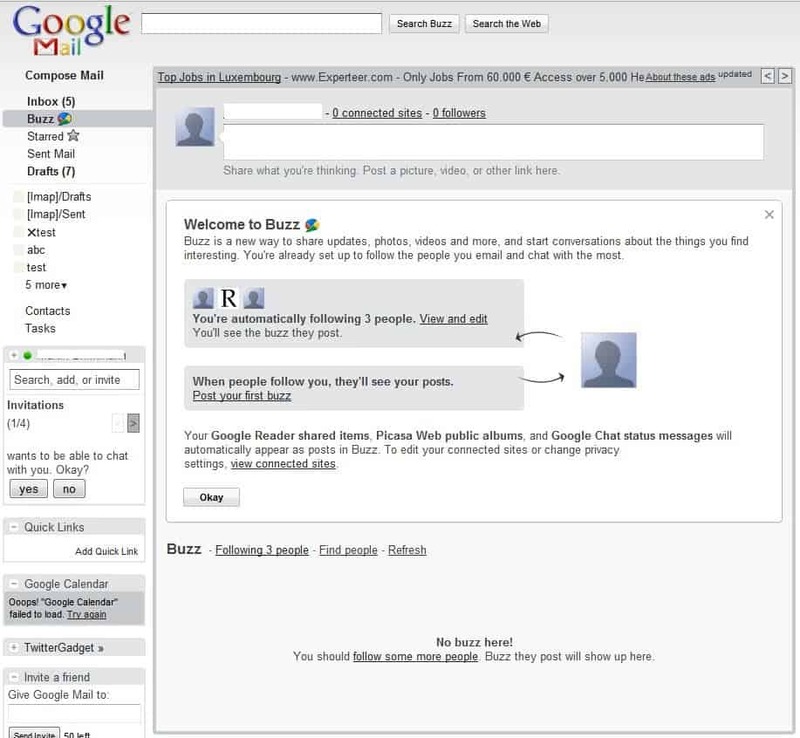 Google Buzz is the latest service that is being rolled out from today on to all Gmail users. It is a social networking service to share updates, photos, videos and more with contacts. If you think Twitter, MySpace or Facebook then you got the general idea what Google Buzz is about. Gmail users who have already been invited to the service by Google will see a notification the next time they log into Gmail. If they chose to use Google Buzz they are redirected to a Gmail website that looks still pretty much like Gmail but comes with a few changes. The left sidebar has been extended as it now contains a Buzz link which leads to the Google Buzz page on Gmail. The Buzz page lists buzz posted by the owner of the account and by followed users which resembles Twitter. Google picks a few contacts that will be followed automatically and posts Google Reader shared items, Picasa Web public albums, and Google Chat status messages automatically on that page. It is furthermore possible to connect additional sites to the Buzz account. This includes websites that have been added to webmaster tools, additional Google services like YouTube or Blogger as well as Twitter and Flickr. All those services and websites can be added so that updates are posted automatically in Google Buzz. It is possible to write buzz messages which can be compared to Twitter messages sans the 140 char limit. These messages support links and photos which you can include in the message. A link is resolved automatically and added with the website's description while photos need to be uploaded before they are displayed as thumbnail images directly in the message. Some links will also be displayed directly including YouTube urls that can be played directly in messages. Messages can either be private or public. Private messages are only accessible to specific users while public messages are visible to the pbulic (meaning they will be indexed and are accessible by all users, not just contacts). Other users can comment on messages that you have posted. If you have posted a private message, only contacts can while all Buzz users can comment on public messages. Other social features include emailing messages, "liking" them (yes you can like your own posts). The messages that have been posted to Buzz are accessible in Google Profiles, a service that is also indexed by Google's search engine. Google Buzz has all the requirements to become a successful service. It is linked to Gmail and all Gmail users see the notification upon login. That's a guarantee that it will quickly reach a critical mass of users. The real question is if it can compete with Twitter or Facebook on the same level. The answer to this has to be no unless Google has an ace up their sleeve and plans to add more functions to Google Buzz. Have you already had a chance to test Google Buzz? What's your opinion? Not enabled for me so far and as usual with gmail I suspect it will take much longer to appear for non-english interface language. You mean that R icon? Yeah I seen it as well but cannot remember where. Must be a freak though, hehe. at least, buzz sounds more interesting to young guys. Young guys? Perhaps – but it seems to me to appeal to those out of work. Any age. Any gender. Hi Martin, What theme is that as all the pics of buzz look the same as default. Looks a bit like the wave background–or even live. Pretty cool. It is the minimalist theme of Gmail. You can switch themes in Gmail and the changes will also be made to the Buzz layout. This will not be a success and will definately have no chance at all against Facebook and twitter. simple, Buzz is severely limited, almost akin to a walled garden in that it is only available if you have a gmail account and use it. Maybe 20 % of my friends on facebook have gmail, the rest have different mail service providers. gmail only has around 150 millions of users. This clearly won’t be enough userbase. It’s not about corralling users into yet another cloned service. It is about novel functionality in established and highly popular email service.